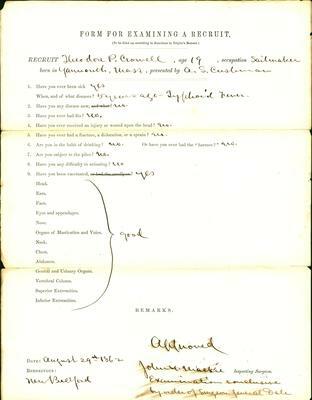 "Civil War Recruitment Examination Form" by Normadeane Armstrong Ph.D, A.N.P. This is the physical examination form for Theodore P. Crowell for enlistment into the Union Army. According to the form, Theodore P. Crowell (19) was examined by John A Mackie on August 29th, 1862 and passed the examination. After enlisting into the army Theodore P. Crowell went on to serve with the 47th Regiment, Massachusetts Infantry (Militia) and attained the rank of Corporal before being discharged. On the back of the form, "T. P. Crowell" and what appears to be his presenter's name are written in.